Fuses Definition States that : A fuses is a short piece of metal, inserted in the circuit, which melts when excessive current flows through it and thus breaks the circuit. The fuse element is generally made of materials having low melting point, high conductivity and least deterioration due to oxidation e.g., silver copper etc. It is inserted in series with the circuit to be protected. Under normal operating conditions, the fuse element is at a temperature below its melting point. Therefore, it carries the normal current without overheating. However, when a short-circuit or overload occurs, the current through the fuse increases beyond its rated value. This raises the temperature and fuse element melts (or blows out), disconnecting the circuit protected by it. In this way, a fuse protects the machines and equipment from damage due to excessive currents. The time required to blow out the fuse depends upon the magnitude of excessive current. The greater the current, the smaller is the time taken by the fuse to blow out. 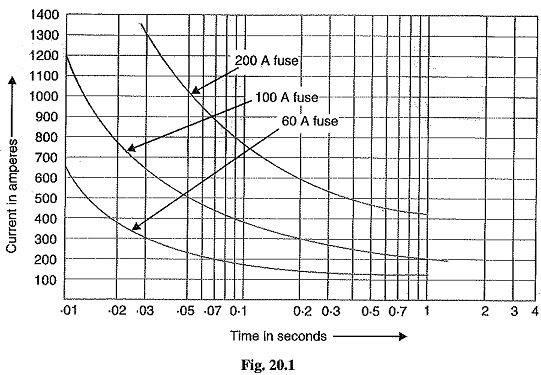 In other words, a fuse has inverse time-current characteristics as shown in Fig. 20.1. Such a characteristic permits its use for over current protection. It is the cheapest form of protection available. Its operation is inherently completely automatic unlike a circuit breaker which requires an elaborate equipment for automatic action. It can break heavy short-circuit currents without noise or smoke. The smaller sizes of fuse element impose a current limiting effect under short-circuit conditions. The inverse time-current characteristic of a Fuses Definition makes it suitable for over current protection. The minimum time of operation can be made much shorter than with the circuit breakers. Considerable time is lost in rewiring or replacing a fuse after operation. On heavy short-circuits, discrimination between fuses in series cannot be obtained unless there is sufficient difference in the sizes of the Fuses Definition concerned. The current-time characteristic of a fuse cannot always be co-related with that of the protected apparatus. low melting point e.g., tin, lead. high conductivity e.g., silver, copper. low cost e.g., lead, tin, copper. The above discussion reveals that no material possesses all the characteristics. For instance, lead has low melting point but it has high specific resistance and is liable to oxidation. Similarly, copper has high conductivity and low cost but oxidizes rapidly. Therefore, a compromise is made in the selection of material for a Fuses Definition. The most commonly used materials for fuse element are lead, tin, copper, zinc and silver. For small currents up to 10 A, tin or all alloy of lead and tin (lead 37%, tin 63%) is used for making the fuse element. For larger currents, copper or silver is employed. It is a usual practice to tin the copper to protect it from oxidation. Zinc (in strip form only) is good if a Fuses Definition with considerable time-lag is required i.e., one which does not melt very quickly with a small overload. It is comparatively free from oxidation. It does not deteriorate when used in dry air. The coefficient of expansion of silver is so small that no critical fatigue occurs. Therefore, the fuse element can carry the rated current continuously for a long time. The conductivity of silver is very high. Therefore, for a given rating of fuse element, the mass of silver metal required is smaller than that of other materials. This minimizes the problem of clearing the mass of vaporized material set free on fusion and thus permits fast operating speed. Silver vaporizes at a temperature much lower than the one at which its vapour will readily Therefore, when an arc is formed through the vaporized portion of the element, the arc path has high resistance. As a result, short-circuit current is quickly interrupted. Current rating of fuse element: It is the current which the fuse element can normally carry without overheating or It depends upon the temperature rise of the contacts of the fuse holder, fuse material and the surroundings of the Fuses Definition. Fusing current: It is the minimum current at which the fuse element melts and thus disconnects the circuit protected by it. Obviously, its value will be more than the current rating of the fuse element. Fusing factor: It is the ratio of minimum fusing current to the current rating of the fuse element i.e. Its value is always more than one. The smaller the fusing factor, the greater is the difficulty in avoiding deterioration due to overheating and oxidation at rated carrying current. For a semi-en­closed or rewirable Fuses Definition which employs copper wire as the fuse element, the fusing factor is usually 2. Lower values of fusing factor can be employed for enclosed type cartridge fuses using silver or bimetallic elements. It is the r.m.s. value of the first loop of the fault current obtained if the fuse is replaced by an ordinary conductor of negligible resistance. 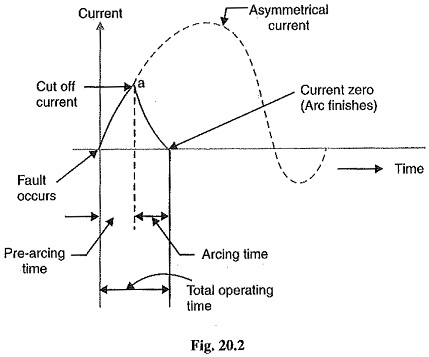 Cut-off current: It is the maximum value of fault current actually reached before the fuse melts. It may be mentioned here that outstanding feature of fuse action is the breaking of circuit before the fault current reaches its first peak. This gives the Fuses Definition a great advantage over a circuit breaker since the most severe thermal and electro-magnetic effects of short-circuit currents (which occur at the peak value of prospective current) are not experienced with fuses. Therefore, the circuits protected by fuses can be designed to withstand maximum current equal to the cut-off value. This consideration together with the relative cheapness of fuses allows much saving in cost. Pre-arcing time: It is the time between the commencement of fault and the instant when cut off occurs. Arcing time: This is the time between the end of pre-arcing time and the instant when the arc is extinguished. Total operating time: It is the sum of pre-arcing and arcing times. It may be noted that operating time of a fuse is generally quite low (say 0.002 sec.) as compared to a circuit breaker (say 0.2 sec or so). This is an added advantage of a fuse over a circuit breaker. A fuse in series with a circuit breaker of low-breaking capacity is a useful and economical arrangement to provide adequate short-circuit protection. It is because the fuse will blow under fault conditions before the circuit breaker has the time to operate. Breaking capacity: It is the r.m.s. value of a.c. component of maximum prospective current that a fuse can deal with at rated service voltage.